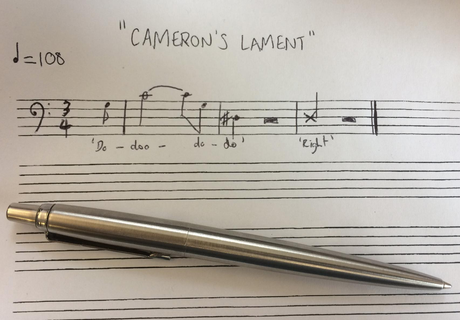 David Cameron was heard humming a bright but confusing little tune as he re-entered 10 Downing Street. So we wrote it out and analysed it as best we can. Understandably, the media have jumped on this surprising musical act, but we’ve investigated further. Let’s start with the time signature. A brisk 3/4, with a crotchet roughly equalling 108 a minute, suggests activity. Positivity, even. But 3/4 is not the most immediately stable of signatures. It’s easy to feel secure in 3/4, but for just a couple of bars it’s disconcerting - especially when starting with an anacrusis. Harmonically, too, it’s ambivalent, confusing. It’s almost fanfare-like in that confident leap of a fourth from G to C, but it quickly loses confidence when it mirrors the ascent later in the bar, plummeting down to D sharp, forming an awkward implied triad. And then the percussive spoken ‘Right’, which lands almost perfectly on the first beat of the next bar, is a strange dip into acted-out recitative - demonstrative of a reasonable knowledge of contemporary composition techniques. There is a theory that the soon-to-be-former PM is actually humming the opening of Shostakovich's Fifth Symphony – of which more here.